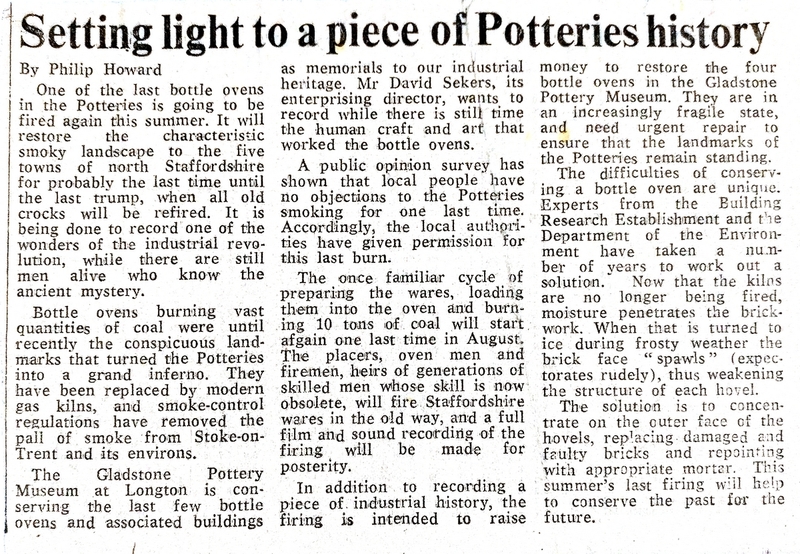 The writer’s first acquaintance with bottle ovens was in the mid 1950’s when he was expected to reveal to pottery students (with an air of authority, of course!) the mysteries of ‘baiting’, ‘bungs’, ‘medfeathers’, ‘well holes’ and so on. Although being rapidly replaced by more efficient and less socially offensive kilns, there were still many bottle ovens then in operation. By the early 1960’s, the Clean Air Act, by forbidding the emission of black smoke, dealt them their death blow, although a few did survive for a short time by being converted to use cleaner fuels than coal. 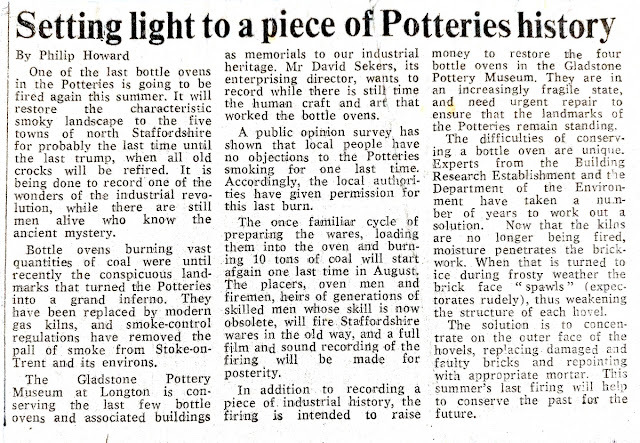 Thereafter, hundreds of bottle ovens were demolished; others became either unused or were used for storage. 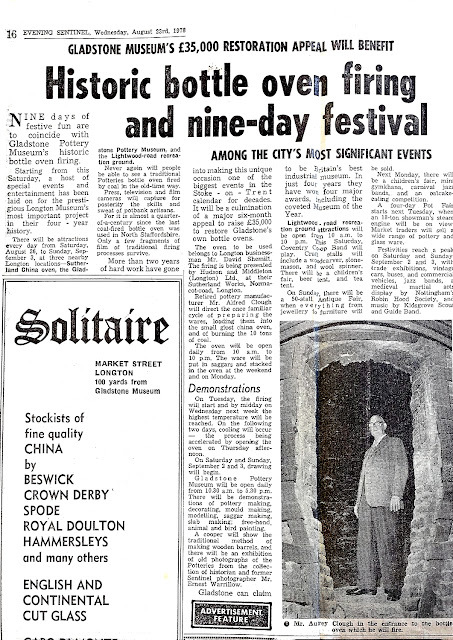 A survey in 1975/6 listed about 63 bottle ovens still standing; since then, many more have disappeared. 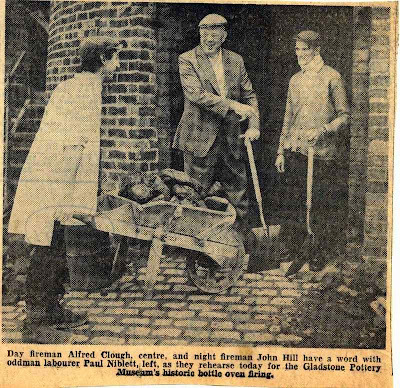 The five bottle ovens and buildings that now form an important part of the Gladstone Pottery Museum only just escaped being razed to the ground. Even so, after some 20 yrs of exposure to frost and damp, these ovens are now in urgent need of repair, and a £35,000 restoration appeal has been launched; however, it will take several years before the work is completed. Partly with this in mind, and also to obtain a detailed record of a bottle oven firing, permission was sought to carry out a firing as a one-off exercise. 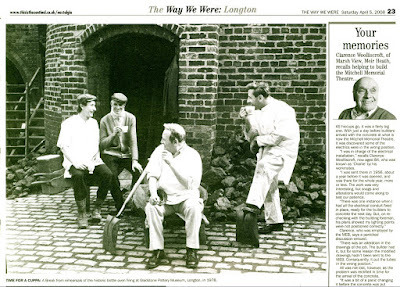 The firing eventually took place between 26 August and 3 September , at the nearby Sutherland Works of Hudson and Middleton (Longton) Ltd., the museum ovens themselves being unsafe for firing. Who better qualified to supervise the operation than the well-known former pottery manufacturer and Past President of the Society, Mr. Alfred J. Clough, whose early practical experience in the industry included firing bottle ovens. 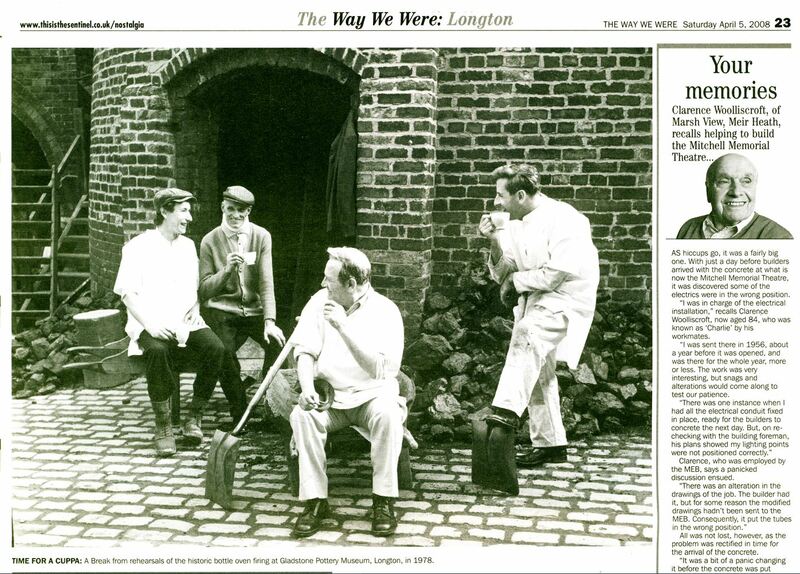 Two other stalwarts, Mr. John Hill and Mr. Ted Lockett, both now retired after a lifetime’s experience, acted respectively as [night] fireman and cod placer. Days l, 2 and 3 were occupied in placing and setting. 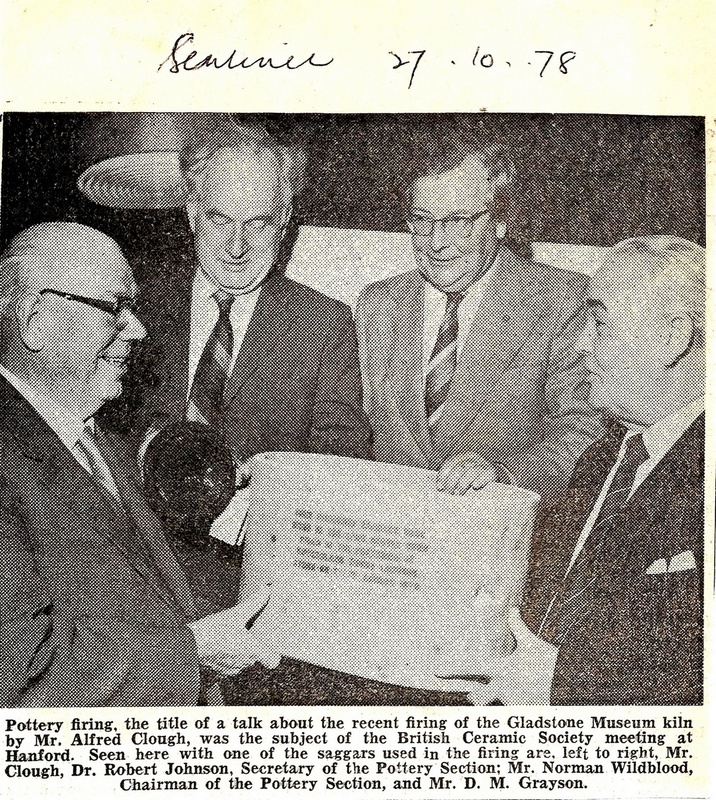 There were nearly 1200 saggars of glost-ware to be fired, the majority of which was Gladstone ware, but several pottery manufacturers had bought saggar space. Firing commenced at midday on day 4. Maximum temperature (1050°C) was achieved on day 5, firing being completed the same evening. Cooling down then began and was later accelerated by removing the clammings. On days 8 and 9 the saggars were drawn and passed from one man to another and on to the sorting bench, with a deftness normally seen on the rugby field. After sorting, the ware was made available for disposal. 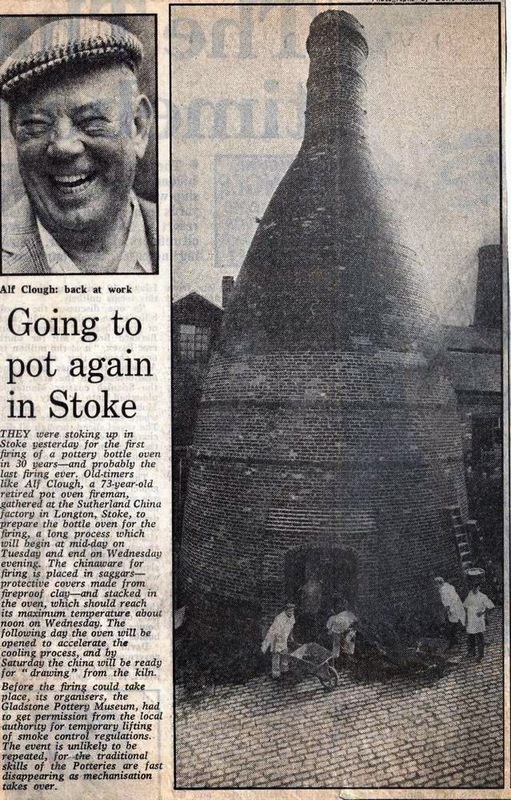 During the course of the firing, Dr. Michael Kennedy of the City General Hospital, Stoke-on-Trent, who has been interested in potters’ health since 1947, made tests for fumes and dust. Special glass capsules from the Atomic Research laboratories, Harwell, were used to measure nitrous fumes, and were attached to the firemen’s overalls and to the surrounding walls. A sound film was made for the Museum by Aston University, and a log of events was tape-recorded throughout the firing by Mr. Terry Woolliscroft who works for Enoch Wedgwood (Tunstall) Ltd. and is a volunteer at the Gladstone Museum. Many pieces commemorating the firing, some fired in the bottle oven and some elsewhere, were offered for sale, in addition to a large number of saggars. One of the outstanding pieces was a bone china plate designed by John Piper, one of Britain’s best-known artists. Of particular interest were reproduction Staffordshire tygs - 17th century drinking vessels, having rows of little knots or pegs of clay stuck on at certain distances downwards from the rim. Drinkers had to drink down to the lowest peg at a single draught or be “taken down a peg”. The examples produced during the bottle oven firing were doubled handled. Types made in the past were of various sizes and some early ones had as many as 10 handles, for passing round - the tyg was in fact a relative of the posset pot. 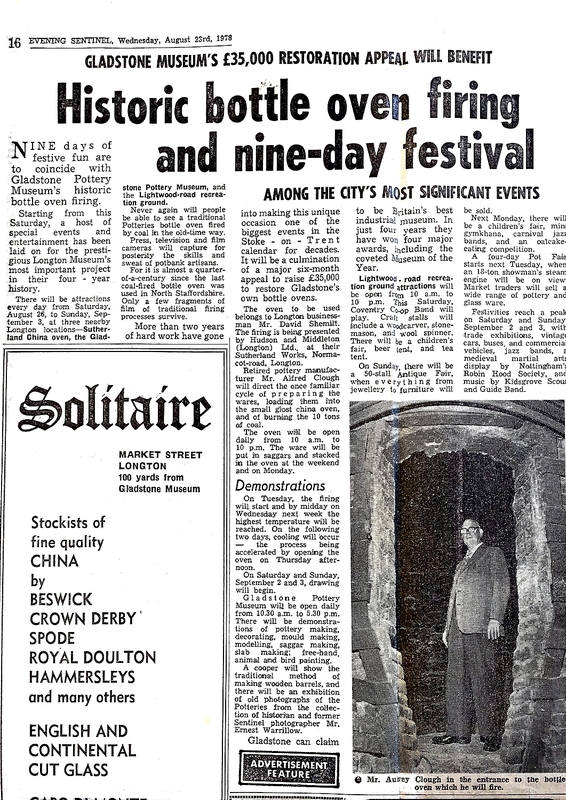 Associated with the actual bottle oven firing, there were a number of popular events on or near the site, including a pot fair, fun fair and extra demonstrations of traditional pottery manufacturing operations at the Gladstone Museum itself. The total attendance was 11,707. The firing was a remarkable and indeed unique venture, which relied heavily on a band of enthusiastic volunteers. 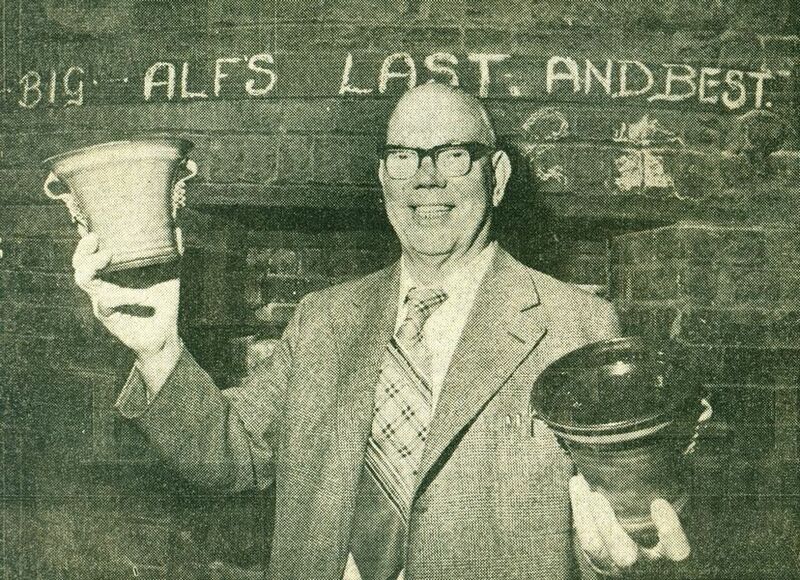 Mr. A. J. Clough gave a talk entitled “Pottery Firing” to the Pottery Section on 25 October ; a summary will be published in the next issue of the Transactions and Journal of the Society.